Active Release Technique (ART) incorporates soft tissue with the client’s active stretching. ART is the state-of-the art technique that can release adhesions and break down scar tissue to not only resolve stubborn and long-standing injuries/pain, but also to allow athletes to perform better after removing tissue/movement restrictions they may not even have known they had. Many of the conditions mentioned above are a result of overused muscles, which can cause your body to produce scar tissue. Scar tissue and muscle adhesions restricts tissues that need to move freely, which can cause reduced range of motion, loss of strength, and pain. ART is not a soft, gentle technique. It is not a gentle massage, but it will make you feel better. Whether you want to prevent injury or improve your performance, a soft-tissue release/ART session can help athletes of all levels free themselves from what may be holding them back. Lawrence Van Lingen is the certified ART Specialist at Rausch Physical Therapy & Sports Performance. 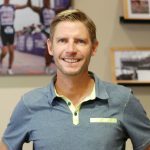 He has worked with elite athletes for more than 20 years and is now also available to work with Rausch PT patients and athletes. Click here to learn more about Lawrence. Want a monthly complimentary 30-minute ART session and discounted ART and massage?